Christmas Hooked Stockings are the most necessary decorating piece to welcome Santa. In tradition, we make our own stockings by hand, and now, Glitzhome offer skilled hand craft stockings for you. The front knitting is 100% hand work. 3D applique design provides unique visual effect. Santa will definitely put treasured gifts in the stocking. Choose from 50 unique selections such as Santa, Snowman, Animal and other Christmas related theme. Only in Glitzhome Store. 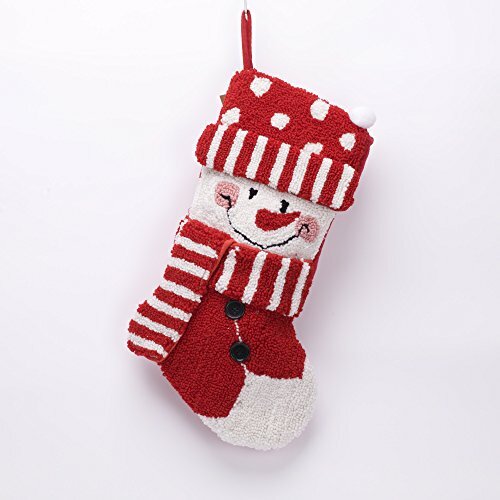 High Quality Material: Glitzhome Christmas Hooked Stocking is made from 100% Acrylic Fiber front and 100% Polyester back. The fabrics are very durable. The material provides soft and smooth touch, and can hold more candies and gifts. HANDMADE KNITING: The front is 100% handmade whimsical design and features a reindeer surrounded by festive details. Decorative top border, felt hanging loop, and holiday accents. Detailed knitting and generous embellishments are sure to enhance any type of holiday decorating theme. Christmas Theme Design: As cozy as a winter sweater, our stockings add a warm touch to the mantel. Christmas Stockings feature a 3D-appliqued cuff that resembles a reindeer. Its graphics and colors give a very Christmas feel that are ideal for depicting the true nature of the season. Easy to Apply: The Christmas Stocking can be hanged on Christmas trees, fireplaces with the loop. The ample size won¡¯t limit Santa¡¯s generosity. Work perfectly for candy and gift pouch. VARIETIES OF SELECTIONS: Glitzhome provides over 50 selections of stocking. You can collect several of these whimsical Christmas Stockings, one for each member in your family and set them out to await Santa's arrival with Christmas goodies, to give family members their own special sense of anticipation. If you have any questions about this product by Glitzhome, contact us by completing and submitting the form below. If you are looking for a specif part number, please include it with your message.